AIER Board Member Keith Harvey asks what happened to the union movement and what needs to be done to reverse the decline of unionism. AIER Board member Keith Harvey takes us through the Harvester decision and its legacy. 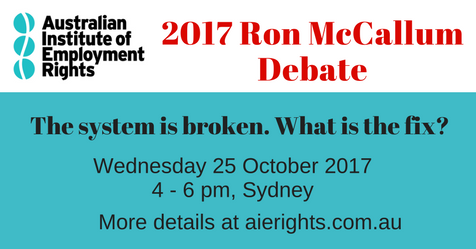 The Australian Institute of Employment Rights held its Annual General Meeting on Thursday 9 November 2017. Thank you to all our members and supporters for the support you have shown for our work over the past year. Read all about it int our Year in Review report. Our presentation included the AIER’s analysis of why the system is broken and an outline of our ambitious project to envisage a new workplace relations architecture. The Fair Work Commission today handed down its decision to cut Sunday and public holiday penalty rates in the hospitality and retail sectors. Here are our initial thoughts on the decision and its implications.